When we first learned of C's hypotonia, I worried constantly about if she was going to be okay. When she struggled to lift her head, I questioned if she would ever walk. Would she be "okay"? When respiratory illness after respiratory illness struck her and landed her in the hospital, I wondered if she would be healthy. Would she be "okay"? When we waited to see specialists and for the results from tests, I hoped this would not be her forever reality. Would she be "okay"? Each fall and bump and tumble resulted in me nervously asking C, "Are you okay?" And with every missed milestone and therapy appointment and hospital visit, I often found myself wondering if I was okay too. When I found myself Googling my life away -- hypotonia search after hypotonia search -- I wondered if I was okay. When I felt angry and sad and stressed with unfamiliar hospitals and unknown diagnoses and my own unrealistic expectations, I questioned if I was okay. Over time, C's hypotonia has become less and less visible to the untrained eye. Not long ago, her inability to stand and walk like her peers was glaringly obvious. Now, not so much. While she still struggles with her fine motor skills, I no longer have to carry her up the stairs; she can walk up them. I no longer have to help her up the playground equipment; she climbs up herself. I no longer worry about her gross motor skills. In fact, sometimes I even forget this journey all started with a gross motor delay. For the most part, I rarely have to ask her if she is physically "okay" anymore. And then there are days like today -- days when hypotonia messes with her body awareness and balance and messes with my anxiety. Today, C got stuck in her chair at school, tried to free herself, lost control and fell, resulting in a bruise on her head and a scratched up chin from the fall. When I picked her up, I immediately noticed her "ouchies." My stomach churned, my heart began to race and worry filled my head. I could feel my anxiety start to take over. Taking a deep breath, I gave C a giant hug, asked her about what happened and listened intently. 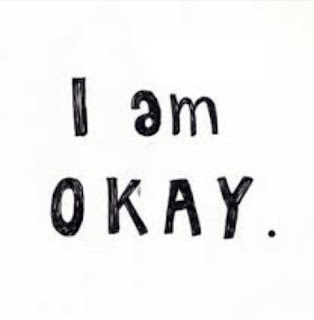 As her story came to a close, I started to utter a phrase I had not thought of or spoken in quite awhile: "Are you okay?" But before I could, C looked at me and said reassuringly, "I'm okay, mom." Deep down, I knew she was. She gave me a little smirk. And I knew -- without question -- I was okay too. Awwww. Love that little bugger! Love y'all! !